Occasionally, you’ll have to work with an Excel table/database that has duplicate entries that you want to get rid off. Excel has a built-in tool for that. In the sample data I'll use, I typed in 16 original/unique entries (actually pizza types) and copied them across 4984 rows. So I have 16 unique entries but 5000 total entries. So let's see how Excel will sort this out for us and delete all duplicate entries leaving the unique 16 entries. Just select the entire table and goto Data menu, Remove Duplicates. And voila! Excel has discovered that we have just 16 unique entries. It has removed the 4984 duplicate entries. 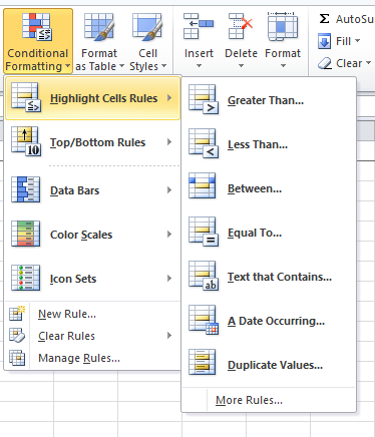 So let's move on to conditional formatting. I don't want to look lazy by giving you a 12 line tutorial. 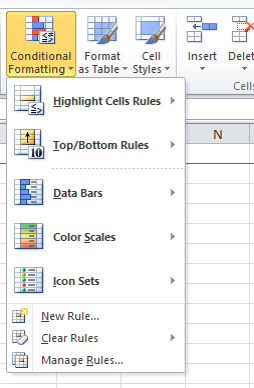 Select the data you want to apply the conditional formatting to. The options are self explanatory. You will be amazed by the out-of-the-box analysis/visualization they provide you.